Home Infographics What Should Global Fashion Retailers Expect in Q2 2019? In this post, we take a look at ecommerce trends in the fashion industry for Q2 2019. So, how can online retailers encourage shoppers to buy more? Don’t let them slip away! Here are some ways that fashion retailers can drive sales. Cart abandonment is a huge issue for all online fashion retailers, the latest data shows that over 70% of shoppers leave an order without completing the purchase. Our research shows that the average abandonment on fashion websites is 76.2%. So when a visitor to your website adds something to their cart but leaves without purchasing, we recommend that brands send a personalized SMS or email with the details of what they’ve left behind in their cart. In the SMS/email there will be a link that will bring them back to a fully populated cart, making it easy for them to finish the purchase. PrettyLittleThing partnered with SaleCycle to combat abandonment. They used cart and browse abandonment emails to encourage shoppers to come back and finish their purchase. Cross-selling is about recommending additional products and services to customers and Upsell is about persuading customers to buy more expensive items. It costs five times more to acquire a new customer than to keep an existing one. A way to encourage existing customers to buy more is by Upsell & Cross-Sell emails. This means customers get shown more products resulting in brands making more money. It works by clever tech that track sales through a brands website and create links between items frequently bought together. 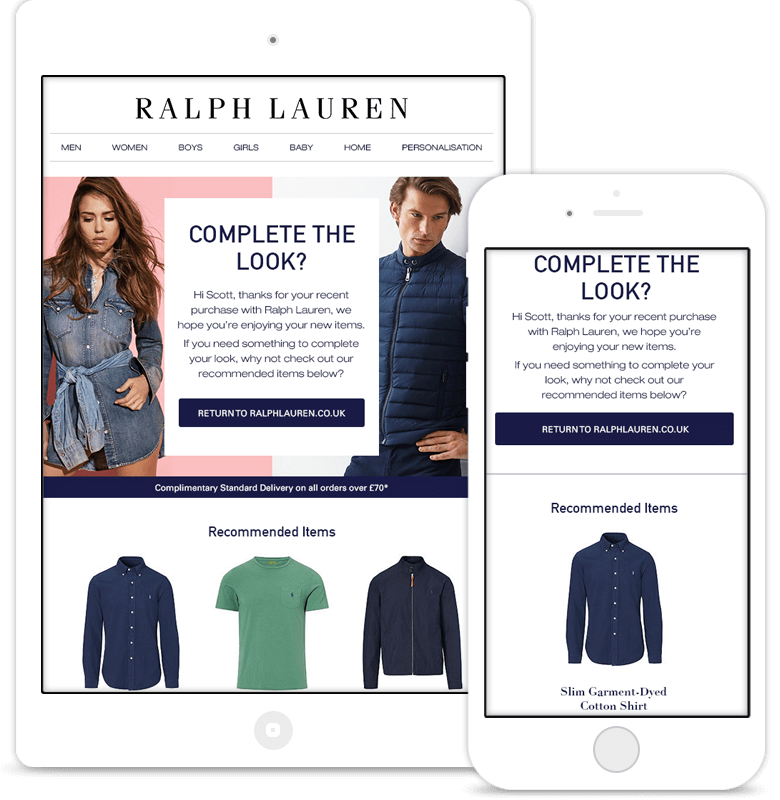 Visitors who then complete the purchase will see a display or receive an email or SMS with personalized recommendations based on their purchase. Live trends is where brands can show how many people have viewed or bought a certain product recently, adding an element of urgency and speeding up conversions. The fear of missing out can drive shoppers to complete a purchase. There are many different ways to use live trends. Time Based. When a visitor first lands on the page or has become inactive for a period a message will be triggered. Exit Intent. A message can be triggered when a visitor takes the cursor outside the window to close the browser. Click Trigger. A message can be triggered when the visitor has clicked on a certain button or link within the page. There are high expectations when it comes to deliveries. Research shows that ‘next day delivery’ is the more preferred ecommerce delivery option. 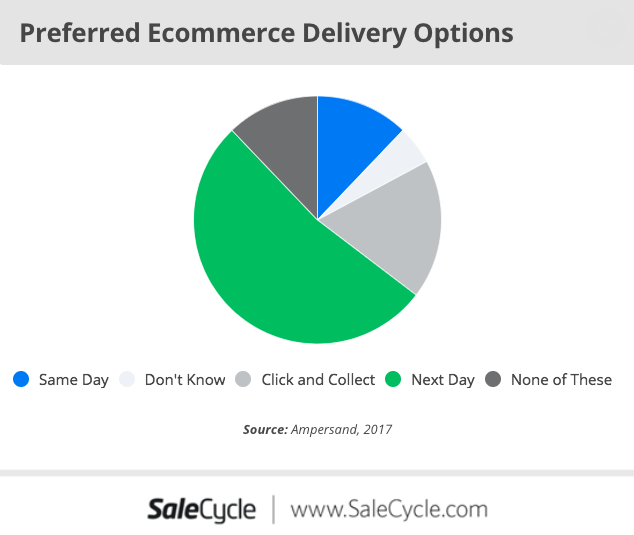 Shoppers still expect next day delivery to be free, but many are also prepared to pay more for speed and convenience, next day delivery or nominated time slots for example. Don’t forget about customer experience, it can be difficult dealing with third party couriers, but it’s important to keep customers happy by delivering on time. Offer clear, accurate tracking online. This can save a lot of wasted time and frustration for customers. Tracking options that give details like expected delivery times are very useful. Use Proactive communication (text or email updates). SMS notifications can be great for this. It can also give customers the option to make adjustments.Every retailer will experience delivery issues every now and then. Use good communication when problems occur. The key is to communicate with customers and keep them up to date. Always offer support. Though shipping problems can often be blamed on couriers but retailers need to take ownership of these issues. Previous articleWhat is Cart Abandonment?